Last December, my mother asked me to figure out what I would like for my Birthday. I am horrible at putting myself first and coming up with ideas of things that I would like. You see, this was not just a gift for last year, it was also for the year before that. Finally, I decided that I would really like to look at Pandora bracelets. I really liked the idea of making a bracelet that had beads that were filled with memories. This is what my bracelet looked like when I originally received it. 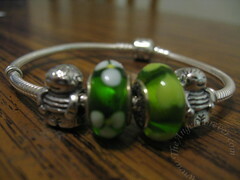 I have the two boys and a Murano glass bead that looks like each birthstone. A week or so after this, TechyDad bought me the forget me-knot bead to symbolize our marriage. Just after that, I received a gift certificate to Pandora from my Aunt S and Uncle M. I knew that I wanted to get the angel charm, but also wanted to get one to represent TechyDad. Sad to say that Pandora has nothing technology based. So I waited to see if anything new and perfect would come along. Pandora mentioned new beads several times, but nothing really perfect came along. Last night, I decided to go to the local Pandora store with my mother to see what new beads they had. I really wanted to use my gift certificate before I accidentally misplaced it. There were two beads that immediately caught my eye. I quickly decided to go for it. 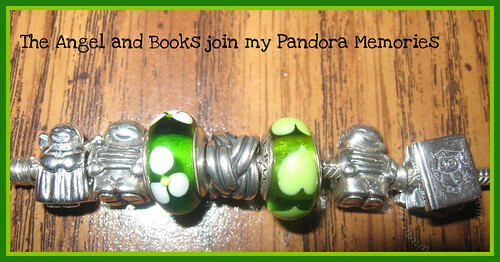 Here is a look at my Pandora bracelet with the two new additions. I went with the angel thanks to The Angel Forever. The book symbolizes being a teacher and having my Masters Degree in Reading. Of course, I have my eye on a few other great beads, but still looking for just the right one that represents TechyDad. Now if only Pandora would team up with Think Geek. A girl can dream right? I love how there is so much meaning behind your beautiful beads!